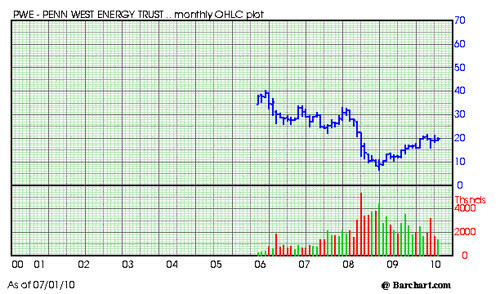 PWE: Penn West Energy Trust is an open-ended investment trust. PWE is in the business of acquiring, developing, exploiting, and holding interests in petroleum and natural gas properties. Risk: You need to further evaluate PWE thoroughly. Well-informed, you decide what to do. Remember that there is risk of loss in all trading. I don’t own any PWE shares. Here are the pluses and minuses. + Dividend: Monthly dividend for July is $14.48 per 100 shares (8.78% yield). – Earnings: For the second quarter of 2010, analysts estimate PWE will earn $-0.11 per share. This is a decrease of 26.38% over the prior year second-quarter earnings.